The INSTEON 2413U Modem is a USB device which plugs into the Virtual Wiring System. 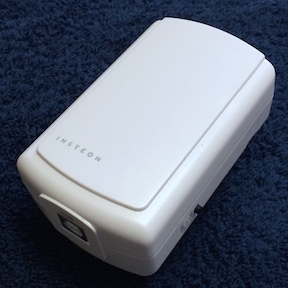 It provides access to all the INSTEON devices in a INSTEON network. When creating an INSTEON network for a Virtual Wiring system, the 2413 Modem Device is the first INSTEON Device added. The 2413 Modem Device has no terminals - its only function is as an interface to an INSTEON network. A 2413U Modem is physically installed by plugging it into a USB port on the Virtual Wiring System. the location of the USB port. In *nix systems, this is in the /dev directory with a name like /dev/ttyUSB0 or /dev/cu.usbserial-00001004. Type "ls -lrt /dev/*" for hints. On Windows systems, the location is COMx where "x" is a number (1,2,3, etc. ).